John Kanas is a legendary figure within the New York banking community. Five years ago, he sold his highly successful North Fork to Capital One Financial. In the course of doing so, Kanas received a $200 million payout. Kanas stayed on with Capital One, but clearly the match was not working out. Capital One agreed to let Kanas resign earlier than his original contract called for. Once he resigned, Kanas decided not to hit the country club circuit. Instead, he orchestrated an acquisition of BankUnited, a failed Florida bank that had been seized by the FDIC. Kanas did so with a private equity group featuring such prominent names as Wilbur Ross, who is known for restructuring failed companies in the steel and coal industries. In recent interviews, Kanas has made it clear he wants back into the New York market. Problem: his Capital One non-compete has not yet expired. 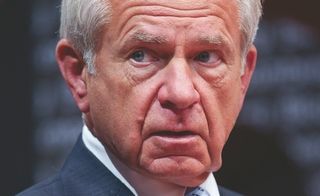 Under Kanas' reworked non-compete arrangement, he is prohibited from competing in consumer or commercial banking within New York, New Jersey, and Connecticut. The restrictions are set to expire August 7, 2012. Capital One claims certain activity by Kanas through BankUnited rises to the level of unfair competition and has enlisted heavy-hitter Orin Snyder of Gibson Dunn & Crutcher to litigate the the non-compete case. Kanas, and co-defendant John Bohlsen, responded with perhaps the nation's best attorney, David Boies. (1) BankUnited already had a banking portfolio which contained mortgages on New York and New Jersey properties at the time Kanas and Bohlsen acquired BankUnited. (2) BankUnited has planned to construct and open branches in New York and has advertised for open positions at these locations. (3) Kanas placed a bid for the Bank of Ireland's New York commercial banking portfolio on behalf of BankUnited. (Bank of Ireland has been forced by that country's financial regulators to sell off a significant percentage of its foreign loan portfolio, and many of the real estate properties are located in New York). (4) BankUnited has entered into an agreement to acquire Herald National Bank, a commercial bank located in Manhattan specializing in small to mid-size commercial lending. The defendants have answered the complaint and from their statements, it is clear they do not believe that alleged activity constitutes a non-compete violation. They are contesting the reasonableness of the agreements they signed and believe that they constitute unenforceable restraints of trade if they were interpreted as Capital One proposes. Interestingly, there is no motion for preliminary injunction on file. The complaint does seek an extension of the non-compete period commensurate with the period of breach, which could be ongoing until next August - depending on what the Court views as a breach. Capital One also is seeking a disgorgement of consideration paid to Kanas and Bohlsen for signing the non-competes, but it's not clear if this would need to be some sort of prorated amount based on the time period each sat out. However, given the dollars paid to both Kanas and Bohlsen (who pocketed $100 million), the claim for disgorgement at least would be well into the 7 figures. This is one of those cases where you can anticipate a discovery fight. The interpretation of the defendants' conduct, and how it fits into the non-compete contracts, will be front and center. That should mean high-stakes depositions and costly document production. It is unlikely that the court would view the non-competes signed in exchange for millions of dollars to be unenforceable restraints. More likely, if the defendants prevail, the court will have to find that Capital One's interpretation is incorrect. Other high-profile executive disputes, such as that involving involving Mark Hurd, have settled quickly, so perhaps all sides will determine that a confidential settlement is the best option. Virginia law governs the non-compete contracts, so that state's blue-pencil rule could pose a problem for Capital One if the court finds that the contracts contain some overbroad terms. Virginia's Supreme Court has not approved of a blue-pencil rule, though the case law there is employee-friendly in many respects and courts "discourage" modification of overbroad covenants.